This mesmerizing, surreal account of the bizarre adventures of Terence McKenna, his brother Dennis, and a small band of their friends, is a wild ride of exotic experience and scientific inquiry. Exploring the Amazon Basin in search of mythical shamanic hallucinogens, they encounter a host of unusual characters -- including a mushroom, a flying saucer, pirate Mantids from outer space, an appearance by James and Nora Joyce in the guise of poultry, and translinguistic matter--and discover the missing link in the development of human consciousness and language. 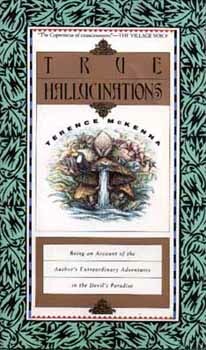 "Mr. McKenna is like a lovely psychedelic sophist . . . a sure sign that Reagan-Bushism is dead and in the ground, and that a wilder social moment may be upon us." "Plenty of down-to-earth reasons for preserving the planet, going beneath the surface of scientific inquiry into the psychedelic experience, and some truly amazing dope tales." "Terence McKenna presents a wryly knowing, studiously updated, wholly passionate version of the Psychedelic Revloution, circa 1992. . . . It would be hard to find a drug narrative more compellingly perched on a baroquely romantic limb than this passionate Tom-and-Huck-ride-Great-Mother-river-saga of brother bonding. . . . Put simply, Terence is a hoot." Terence McKenna is the author of Food of the Gods and The Archaic Revival, and the coauthor, with Dennis McKenna, of The Invisible Landscape: Mind Hallucinogens, and the I Ching.